The school year is coming to an end (can you believe it??!!) and maybe you are concerned about what your children will do all summer or how they will carry their progress over the summer until school starts again. Teachers are often approached by parents as the school year winds down with concerns of what they can do to make sure all the progress their little ones made this school year carries over to the next year. This year teachers can point to the experts at Super Duper Publications who have many games for parents to consider for leisurely summertime learning. To avoid the so-called summer slide, games by Super Duper like Grammar Chipper Chat, Granny’s Candies and Sentence Fill-In Fund Deck can offer much needed review for those who struggle with reading, auditory processing and language. Better yet, these boxed games and fun decks go anywhere -- sitting in a restaurant, wai ting at the airport or playing in the backyard with siblings. Super Duper has a long history (28 years and counting) of mixing fun with learning, especially for those who struggle with reading, auditory processing, and language. A whole warehouse of delightful products can be found at their website, www.SuperDuperInc.com, with descriptions and tips for educational tools for every type of learner. My favorite summer activity from Super Duper for my son is the Say and Glue for Language and Listening! "Find the ladybug. Glue it on the ground." Early learners have a chance to be in cut-and-paste heaven while they listen and learn six important language skills: categorizing, telling what items are used for (functions), following complex directions, following conditional directions (if…then), retelling stories (semantic recall) and understanding basic concepts. Appropriate scissors and glue not included. My son has recently really gotten into cutting and gluing so I knew he would love this book and it is the perfect book for keeping him busy this summer on days where we can't get outside and play! 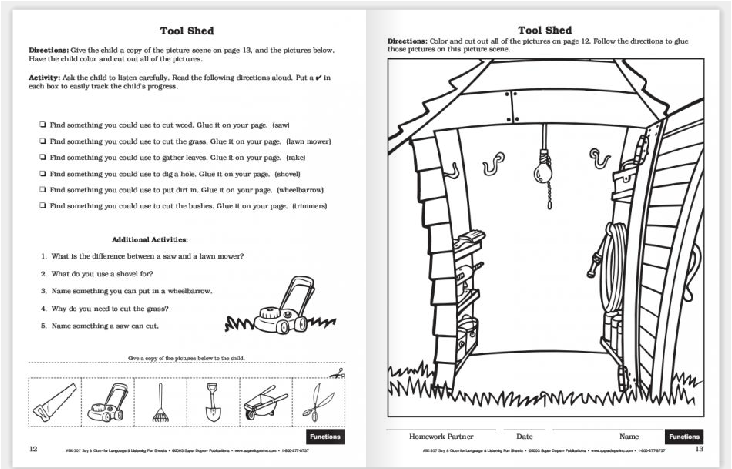 This book does require that an adult is there to ask the questions and it also requires that you make a photo copy of the items to be cut out if you don't want to ruin the page before it. But overall, my son loved completing the activities, cutting out the squares and gluing them in the right places! There are LOTS of activities included in this book and it will definitely last the whole summer! Buy It: You can purchase Say and Glue for Language and Listening for $36.95 from the Super Duper website. Win It: Super Duper is generously offering (1) Say and Glue for Language and Listening, Sentence Fill-In Deck, or the Understanding Sentences deck to a lucky winner!